Day 2 of the Intelligent Assistants Conference burned just as brightly as the first. If you haven’t yet read our colleague’s blog on the first day of the event, you can find it here. Darrius Jones, AVP of Enterprise Innovation at USAA, started proceedings by giving us some insight into upcoming virtual solutions in the mobile banking sector. In his keynote presentation “This is Our Moonshot”, he assured us that virtual assistants (VAs) have come a long way from the chatbot toys of yesteryear, and people are trusting VAs more and more with handling information about their lives. In fact, when looking for advice about sensitive topics like financial difficulty, often users will feel more comfortable asking a machine for help than a person. Having the right tools in place to handle customers’ needs is essential to ensuring that customers leave pleased with the service they receive. In addition, Darrius discussed how face and voice recognition is being integrated into virtual assistant platforms, cutting out the tedium of the online banking authentication process and helping to combat identity fraud. 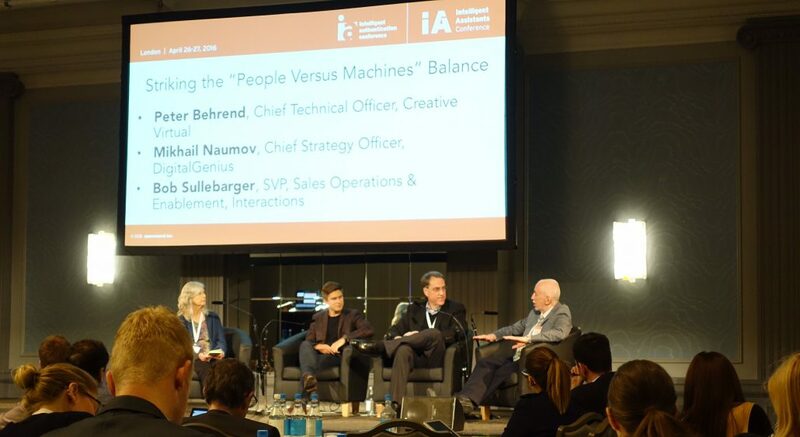 After lunch, it was all eyes on Creative Virtual CTO, Peter Behrend as the panel discussed “Striking the ‘People Versus Machine’ Balance”. 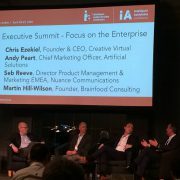 Peter highlighted the importance of Creative Virtual’s capability to allow the user to seamlessly transfer between the virtual assistant and live chat. The best customer experience is achieved when humans and machines work together, each doing what they do best. He explains that in a single session, the VA is able to offer instant, accurate responses to a wide range of questions, while a live agent can provide personal and empathetic insights if a customer has a specific query. 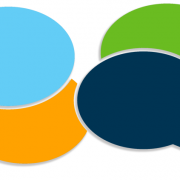 Because VAs are doing the majority of the heavy lifting when it comes to answering the most frequently asked questions, job satisfaction of call centre workers is improving. Live agents are more stimulated now that they can avoid having to answer questions they are asked several times a day. This is a huge benefit for companies that wish to reduce employee churn and save time and money on training. And as we all know, happy workers equals higher productivity and greater customer satisfaction. Day 2 also saw Atos CTO, David Cunningham join the panel discussion titled “Achieving Digital Transformation with Intelligent Assistants” along with Lee Beardmore from Capgemini. 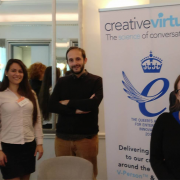 David shared his insights and experiences working with Creative Virtual’s virtual agent technology to deliver Digital Customer Experience Transformation (DCXT). He emphasised the countless opportunities and endless benefits of using VAs on both fronts: internally to assist employees and public-facing to solve problems directly for customers. 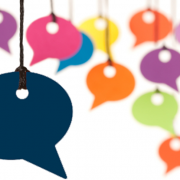 An employee equipped with the VA is able to swiftly navigate to information needed, allowing them to provide more accurate and informative responses to customer queries. Likewise, customers can quickly get the response to their questions or navigate to the information they need, even when not fully sure what they are looking for, via the features at their disposal. 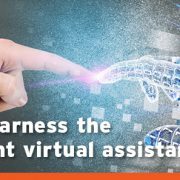 All in all, it was another day of innovation and inspiration from the Creative Virtual team and other experts in the field of virtual assistance. Congratulations to the Opus Research team on hosting a successful and thought provoking conference! Check out some more photos from the event in our IAC London 2016 album.